Fourteen early-morning executions in Chile on this date in 1973 heralded the end of one of the Augusto Pinochet dictatorship’s most notorious human rights abuses: the Caravan of Death. For this “caravan” picture not camel-borne spice traders but a helicoptering death squad. In the bloody aftermath of Pinochet’s September 11, 1973 coup against the elected socialist government, the new strongman’s buddy Gen. Sergio Arellano Stark took this evil-omened chopper on a south-to-north tour from prison to prison beginning September 30 — leaving its wares behind at each stop, in the form of spent shells and murdered men. 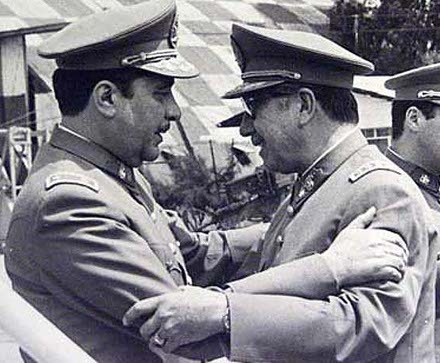 Arellano and Pinochet were all hugs hours before the caravan departed. was to set a drastic precedent in order to terrorize the presumed willingness of the Chilean people to fight back. But without a doubt, it was also intended to instill fear and terror among the commanders. To prevent any military personnel, down to lowest ranking officers, from taking a false step: this could happen to you! And indeed, several officers were also sacked along the way, a couple even imprisoned and tortured. Their lenient treatment of presumed subversives constituted “failure to fulfill military duties”: one can readily imagine the impression made upon junior officers in Pinochet’s armed forces. Said subversives had it worst of all, of course. These were people already in prison, many having voluntarily turned themselves in upon request after the coup; they were drug out of cells in the dark of night and machine-gunned, or worse. Close to 100 defenseless political detainees died this way over a three-week span. The Caravan reached Antofagasta on October 18, where Gen. Arellano was received by the zone chief Gen. Joaquin Lagos. Arellano’s unit did its dirty work overnight: the names of its 14 victims on this date’s early hours are recorded here. One was an 18-year-old student, one a 66-year-old “maritime worker”. Several were figures in local government. Lagos was horrified the next morning when he discovered what his guests had been up to — and he immediately gave Pinochet his resignation. I felt hurt, powerless and angry [Lagos later said] that a criminal action of this nature that had been committed in my jurisdictional zone and behind my back. Lagos had the juice to make this sort of gesture without winding up in prison himself: indeed, he gave Pinochet his resignation (and the reason) personally. Though Lagos has said that Pinochet seemed much more concerned about his (Lagos’s) attitude towards the atrocity than the atrocity itself, he (Lagos) also remembers Pinochet placing a call to Gen. Arellano and, not reaching him, leaving his nomadic deputy a message “not to do anything more.” The Caravan did stop on Oct. 22: maybe, Lagos’s resignation did the trick, at least to the extent one can attribute any cause to the cessation. This outcome will always rate a bullet point on the brief against the “superior orders” defense. Relatively speaking, these unfortunates are only one puddle of blood among seas from the Pinochet years. Still, the Caravan of Death in particular was (and still is) a focus of the indictments handed down against him after the return of civilian government, thanks in no small part to Gen. Lagos’s willingness to go on the record about it — and as a result, many of the legal maneuvers around Pinochet in the last years of his life, both in Europe and Chile, concerned this horrible affair. Pinochet finally died in December 2006 while under house arrest for two specific Caravan of Death murders. While alive, however, his legal team predictably attempted to blame local commanders for the Caravan’s atrocities; in response to this gambit, Lagos went public on television with his version (which human rights organizations also tend to credit) — along with horrifying descriptions (Spanish link) of the death squad’s activites that left him too “ashamed” to return the victims’ remains to their loved ones. They were torn apart. They were no longer human bodies. I wanted to at least put the bodies back together again, to leave them more decent, but you couldn’t. They shot them to pieces, first the legs, then the sexual organs, then the heart, all with machine guns. From an entire album that Dark Order devoted to the Pinochet dictatorship.